South Korea will hold its presidential election on 9 May. Ms Park is the country's first democratically elected leader to be ousted. Did a puppy bring down the president? Profile: Who is Park Geun-hye? "She told... staff to take good care of the dogs and to find good foster homes for the puppies if necessary," said the spokesman. Ms Park was known to be fond of her pets, which had been dubbed the country's "First Dogs," reported Korea Times. 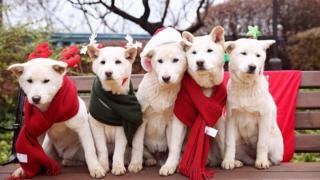 When Ms Park was inaugurated as president in 2013, she moved into Cheong Wa Dae with a pair of Jindo dogs which were given to her as a present. The country has been run by prime minister Hwang Kyo-ahn since parliament voted to impeach Ms Park in December. The date for the next presidential election was set at a cabinet meeting on Wednesday. At that meeting, Mr Hwang said he would not run in the election, dealing a blow to conservatives looking for viable candidates, reported Yonhap news agency. Ms Park has also been summoned by prosecutors for questioning next Tuesday over her alleged involvement in the corruption scandal surrounding presidential aide Choi Soon-sil. But without her presidential immunity, she may be forced to attend questioning if she refuses the summons this time round, reported Yonhap.